In exile, along with other leading Yorkists, the earl of Warwick sails from Calais to Ireland for talks with the duke of York and to collect his mother, who has had to flee England after being attainted along with her husband and sons at the November 1459 parliament. 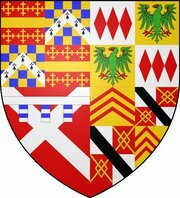 Henry Holland, duke of Exeter and hereditary Admiral of England, fails in an attempt to stop Warwick on his way back to Calais. Death of Anne Nevill, Queen of England. Anne was the younger daughter of Anne countess of Warwick and Richard Nevill earl of Warwick. She was born on 11 June 1456. Married to Edward Prince of Wales in December 1470, she was widowed after the battle of Tewkesbury. No-one is sure of the date of her marriage to Richard duke of Gloucester, but it was probably c1472. She and Richard had one child, a son Edward, who died in April 1484. Birth of Edward of Lancaster, Prince of Wales, to Margaret of Anjou and Henry VI of England. Edward married Anne Nevill, daughter of Richard Nevill earl of Warwick in December 1470. He was killed at the battle of Tewkesbury in May 1471. Betrayed by Andrew Trollope and the men of the Calais garrison, and refusing to accept a pardon that doesn’t include the earl of Salisbury, Richard duke of York and his supporters leave Ludlow castle and prepare to flee England. Henry VI is recrowned at St Paul’s. Warwick holds the king’s train and the earl of Oxford carries the sword of state. Anne Nevill and Edward Prince of Wales are formally betrothed at Angers. There is an oathtaking on a piece of the True Cross. Anne’s father, the earl of Warwick, swears to uphold the party and quarrel of Henry VI. Edward’s father, Margaret of Anjou, swears to treat Warwick as a true and faithful subject and never reproach him for past deeds. Coronation of Richard III of England and his queen, Anne Nevill.